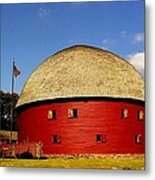 100 Year Old Round Red Barn by Janette Boyd - 8.000" x 5.375"
100 Year Old Round Red Barn art print by Janette Boyd. Our prints are produced on acid-free papers using archival inks to guarantee that they last a lifetime without fading or loss of color. All art prints include a 1" white border around the image to allow for future framing and matting, if desired. 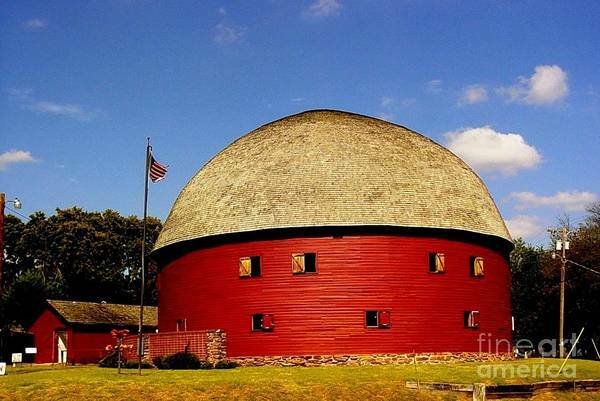 A terrific image of this cool barn, Janette. Thank you so much, Lindley! If you are ever close to OKC, try to go see this. It is very cool! Thank you for the feature, John! 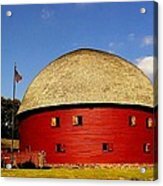 Thank you so much, Tina, for the feature in the "Barn Lovers Group". Thank you so much, Svetlana, for the feature! 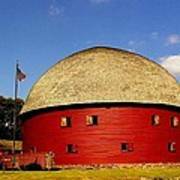 Thank you, Kym, for the "Favorite" vote on the red round barn. One of my favorites, too! Thank you, Nava! Appreciate the lvf, too! Thank you for the nice comment and F/L. I appreciate you viewing! Beautiful shot, great sky-well done! Thank you so much, Chris. Appreciate your comment! Thank you, Marinescu, for featuring this 100 year old barn in your group, "History Around Us". I appreciate your help!. Thank you so much, Robert! You are kind to say that and I appreciate it! Thanks for the vote and favorite, too! Thank you, Sue. This was a very neat place to see just outside of OKC. The upper floor was used for dances. Very cool.